"42 year old male, fallen down stairs, ? # leg, obvious deformity"
Clearly a bad day at the office! We headed round to the address. The door was open and Dave was lying sitting at the bottom of the stairs. There was absolutely no doubt his ankle was broken. Badly broken in fact. Seeing bone protruding from the skin is never a good sign. We dosed him up on Entonox and gave him Morphine. On the count of 2 of 3 I pulled the ankle to straighten it. He screamed, I cringed, it wasn't pleasant but totally necessary. We got his leg splinted and transferred him to ambulance. It is at this point where the NHS bill will change things. Up to this point it would have cost Dave nothing. He will be transported to the nearest hospital. He will be put in a cast. He will have an x-ray. He will be off work for 2 months. He will be charged £7.40 for each prescription he needs. He will be grateful for the treatment he receives. This is how it works. This is how it has worked for decades. This is fair. Everyone gets the same. This isn't going to continue. Up to this point it would have cost Dave a nominal fee for calling the private ambulance. He will be transported to the nearest hospital should he wish to be. He will be put in a cast at a cost. He will have an x-ray at a cost. He will have surgery at substantial cost. He will need medication at a cost. He will need crutches at a cost. He will need physiotherapy at a cost. He will be off work for 2 months at a cost. He will be charged uncontrolled charges for each prescription he needs. He will resent the treatment he receives. He will be left with a bill that could be in excess of £30,000. Why? Because Dave is self employed and cannot afford the expensive monthly premiums for Health Insurance. Dave is a victim of NHS privatisation. Dave will walk with a limp for the rest of his life because he couldn't afford the surgery or the physiotherapy. Dave suffered in pain because he could only afford Paracetomol. Dave picked the things off the price list he could afford. Next time Dave won't call an ambulance. Dave won't be alone. 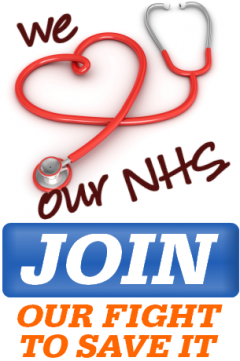 How many people can realistically afford over £100 a month or more for medical insurance? The private health insurance company are already starting their campaigns and as predicted, are not targeting the people who need treatment for severe chronic conditions. These people will sadly be priced out of the market as it isn't 'cost effective' to insure them. Instead they are targeting the 'fit & well' who don't need and are unlikely to need any treatment. They will be profiting from fear alone and the vulnerable with be left by the way side. Let us not be fooled into thinking we will no longer pay national insurance. Of course we will. We just won't get anything for it. How many people like Dave with have to sacrifice their well being because they are not well off? How many of the elderly will refuse to call an ambulance through fear that health care will cost them their home? This is the reality of what the NHS Bill will mean in the long term. It starts with a bit a outsourcing and before you know it, we are the USA, where every politician receives financial benefits from the "Health Care' companies that are crippling its population. These proposals are a complete joke and regardless of the spin that is put on the NHS Bill, this is where it is heading. We will no longer be the world's biggest 'free at point of contact' ambulance service. We'll just be another money grabbing, profiteering ambulance service owned by a faceless millionaire. We will no longer have an NHS where everyone can get treated free of charge regardless of social status. We'll be all be treated in relation to our wage packet. The only people who stand to benefit from this are the Eton Old Boys who run this country for their own personal gain. It's happening.